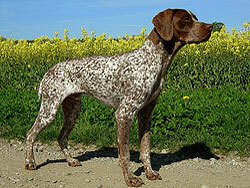 Both breeds of the Braque Francais are medium to large sized hunting dogs with long legs and long drop ears. The tail is traditionally docked but may also be long, or naturally short. 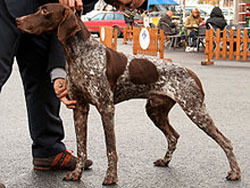 The coat is short, and chestnut brown or white speckled with brown in color, often with one or more large brown spots. Their head is usually brown. The Gascogne is about 10 cm (3.9 ins) taller at the withers than the Pyrenean. 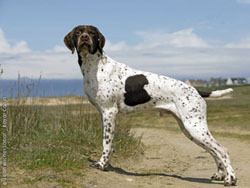 The Braque Francais, type Pyrénées dogs are 47 - 58 cm at the withers (18.5 - 22.8 ins, females slightly smaller), giving the impression of "a German shorthaired pointer shrunk down to Brittany size". The coat of the Gascogne is thick, while that of the Pyrénées is described as "finer and shorter" than the Gascogne. The Pyrénées is usually more mottled brown on the body. The head of the Braque Francais Pyrénées is slightly broader, and the ears are not as long. On the Gascogne, if the ears are pulled forward, they will reach the tip of the nose. The Gascogne has slightly pendulous lips, making the muzzle appear square; the Pyrénées muzzle looks more narrow. No specific diseases or claims of extraordinary health issues or concerns have been documented for the Braque Francais. The ideal Braque Francais temperament is described as "friendly, sociable, gentle and submissive" and, as a soft breed, should not be subjected to harsh training methods. Temperament of individual dogs can vary, and all dogs must be well socialized with people and other animals at an early age in order to be a good pet. The Braque Francais breeds are not just pointers, but versatile hunting dogs that can retrieve, flush, and even trail game in all sorts of terrain. The Pyrénées is a quick dog that can move fast without sprinting, while the Gascogne is a slower moving dog. 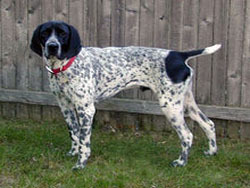 Additional breed information for the Braque Francais Gascogne can be found at the United Kennel Club website. Additional breed information for the Braque Francais Pyrénées can also be found at the United Kennel Club website. © 2006 - Autumn Breeze Kennel. | A Professional Gun Dog Trainer in MN.